My favourite breakfast cereal used to be advertised with the sounds Snap, Crackle and Pop featured and were welcome sounds each morning. When the same sounds began to come from the iMac's left speaker last week, I was somewhat less than pleased. As the plug-in headphones were still perfect, the sound card was not the problem. The houseboy's high volume, percussive music had finally taken its toll. I had been thinking about external speakers for a while but it is one of the list-items, like the new washing machine, a replacement television and a new motorcycle that, while on the list, do not normally approach the top while other priorities exist. Hearing the Mac's startup "bong" just once with the duff speaker was quite enough and I was off to the shops on Saturday morning with some possible ideas. Included were the Harmon-Kardon "Soundsticks", with the sub-woofer that looks like a fish bowl, some Boston Acoustics speakers, and the Harmon-Kardon "Creature" speakers. My first call was to the Apple shop in Siam Discovery Center where I always get good treatment. There was a set of Harmon-Kardon Soundsticks in use, plugged into a PowerBook, when I walked in. They sounded good; and I think they look great. 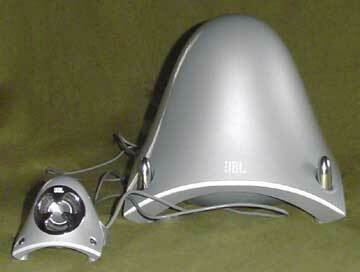 There were also a couple of boxes of the small sphere-shaped speakers that work with the flat panel G4 iMac. As these were priced at just under 5,000 baht, they were also under consideration. I asked first about my iMac. Not a part I can replace myself and not one that this shop will do. Maccenter was recommended. Soundsticks? 12,000 baht: not this month. Little spheres? Not for the G3 iMac. Creature speakers? Sorry: no have. Honest answers that produced no sale: I will be back. A 79 bus took me round to Phantip Plaza and I squeezed my way up to floor three, where I had seen some of the Creature speakers last week. They were at about 5,500 baht, which was about 1,000 baht less than I had seen them in a Mac shop in Phantip a few months ago. Deal done. Visually, they might be an acquired taste, but the Mac does not look its best with little boxes alongside. Setting up the three speakers was really easy. They use a headphone jack and have their own power source. (The Soundsticks are plugged into a USB port.) The two small speakers -- normally either side of the computer -- plug into the large speaker. The right-hand speaker adjusts volume via touch-sensitive controls; the large speaker controls treble and bass. How should one test such speakers? The Ride of the Valkyries seemed reasonable, and I cranked it up. This must be one of the rare occasions when a local -- a common complaint here from some westerners is that Thais seem impervious to noise -- has reached for the button to reduce the volume. I am no audiophile but listening to works such as the Britten Requiem (Hickox) produced a much clearer sound than I had heard for a while. While the iMac speakers had caused some rippling to the monitor image in loud passages, there was none noticable with the Creature speakers even when I held them unrealistically close to the computer. While in the Copperwired shop, I noticed that the PCi Bluetooth adapter was still at the same price: a little over 2,500 baht. I saw in a catalogue recently that one shop in Britain was offering the same adapter for an equivalent price of 3,500 baht. Some of my students are doing a project using Bluetooth with a PC and they showed me an adapter that they had bought, priced at 1,300 baht. It was three times the size of the PCi adapter but did have a plastic cover for the USB connector. We put it into the G4 in my office and Bluetooth activated immediately, but it would not work with my Ericsson phone, while the PCi adapter would. After a bit of puzzling, I made the mobile phone discoverable and we paired it with the new adapter in place. 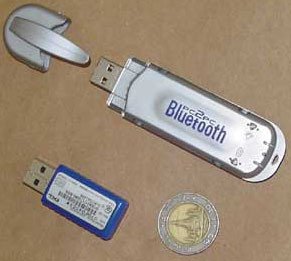 The specifications for Bluetooth include frequency-hopping for security; and the rate/frequency negotiations are part of the pairing. It seems that another adapter used on a computer will recognise a mobile phone as a completely different device. Ian Page recently made available a new version (2.0.4) of his Mactracker. This latest version includes information on the G5 computers announced thus far (named Omega and Q37, apparently). There is now also a useful section on software versions as well as the usual data on computers and peripherals. He has also just released a beta of a Windows version of Mactracker, intended for those strange people who "who sell or support Macs but use Windows PCs". The utility for both Mac and Windows can be downloaded from Mactracker. Talking of Windows PCs, Thailand made the latest issue of the OpenOffice.org Newsletter with the Government's cheap computers plan. Particularly mentioned was Microsoft suddenly jumping in with cheap versions of Windows: "Microsoft discounts Windows and Office down to $36 in Thailand" (this is about 1440 baht). With recent price reductions in Phantip Plaza (following the government scheme), I have been toying with the idea of a Linux machine as a second computer at home; but for practical reasons, I would also like a version of Windows as a second operating system on that machine. I would be grateful for information on where to buy a legitimate version of Windows at a legitimate price, as all those I have found so far are way above 10,000 baht (see above: 1440 baht). With the new version of OSX coming soon expected to be below 6,000 baht, Windows will not even make my "maybe" list. For further information, e-mail to Graham K. Rogers.